After a humiliating defeat earlier in the season, Holwell gained some revenge by winning 2-0 at the NFU Ground on Saturday. Holwell’s sixth win in eight league games allowed them to close the gap further on sixth-placed Ashby with arguably their most efficient performance of the season. Simon Daws fielded five different starters from the XI which suffered the humiliating 7-0 defeat at Welby Road last October. He was forced to change the starting XI which won 4-0 at Borrowash seven days earlier with Graham Keast out with concussion sustained in that match. In came Kieran Foster with Hallam also replacing Smith. On a deceptively bad playing surface, and with a strong breeze down the field, both sides tried but often failed in building meaningful attacks on the surface. As the half progressed, both sides were guilty of playing the ball too long, too soon, in a scrappy first half with only shots from distance giving both keepers any sort of action. If nothing really happened in the first half, Daws’s half-time team talk seemed to do the trick. 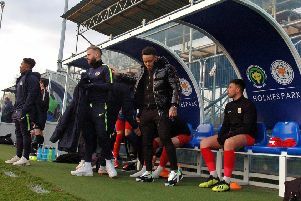 Now playing into the strong breeze, Holwell came out firing and seized the initiative, putting the game to bed within 15 minutes of the restart. Playing at a higher tempo, with shorter exchanges, Michael Stevenson and Chris Hibbitt dominated midfield, feeding Hallam, Foster, Stannard and Scott Mooney into wave after wave of attack. Stevenson’s in-swinging corner eluded everyone before Stannard’s header was cleared off line from his next delivery. But Stannard did make the breakthrough in the 50th minute, volleying in from the penalty spot from Mooney’s assist. Hibbitt slipped when going for goal before Stannard fired wide as Holwell piled forward. Mooney doubled the lead in the 55th minute, dancing past two defenders before cutting in from the left and curling a shot into the far corner. With the visitors rampant, Ashby’s play became very direct and keeper Stainsby was a virtual spectator, protected by Liam Chapman, Aaron Ridout, Parra-Watson, and Harry Calver. Mooney again went close, as did Parra-Watson from a corner, but after this 15-minute spell of dominance, Holwell sat back and saw out the match comfortably, allowing Ashby to play in front of them but never through. Wells replaced Stannard with 10 minutes left, and Barnard was introduced for Hallam in added time. Stevenson went close with a late free kick as did Foster with a shot from the left, but it remained 2-0. The win left Holwell nine points adrift of Ashby, but with three games in hand. Holwell’s good form will be put to the test on Saturday when they travel to table-topping Bardon Hill who have hit 10 goals and conceded none in their last two games. Holwell: Stainsby, Calver, Ridout, Parra-Watson, Chapman, Hallam (Barnard 90), Hibbitt, Stevenson, Foster, Stannard (Wells 80), Mooney. Subs not used: Smith.